"First Choice for Lasting Relief"
Premium quality natural buckwheat hull neck pillows. Discover the ancient Oriental secret to tranquil sleep. Used for centuries in Japan and the Far East for comfort and improved sleep. Now used by millions of people all over the world, for the relief of neck pain, muscle tension, headaches, snoring, low back pain, TMJ symptoms and a host of other conditions. 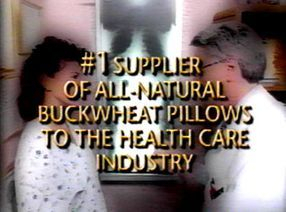 Many just use buckwheat pillows for the amazing sleep comfort because they just can't get comfortable on any other type of pillow. Many celebrities have enjoyed the benefits of the Makura Miracle Pillow and referred others celebs. 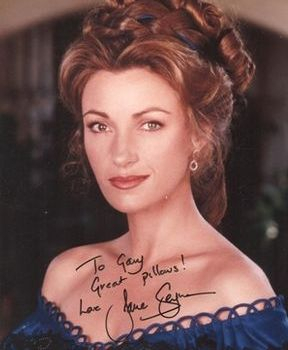 Jane Seymour is here not as a paid endorser. Jane is also a respected designer of bedding, among her many talents. While a pillow is technically not a "medical device", our pillows have been recommended by thousands of Chiropractors, Physical Therapists, Medical Doctors, Massage Therapists, Acupuncturists, Orthopedic Surgeons, caregivers, and many other health practitioners. If you are a health practitioner, please request the Professional/Wholesale information using the Contact form. See our Professional Order page for ordering and patient educational material. One of the reasons people have problems with conventional foam, fiber filled, down filled, and pre-molded pillows is that they are not getting the proper type of head and neck support. The head is tilted wrong and the neck is not supported correctly. You wouldn't stand all day in that awkward position so why sleep in that position? Foam and fiberfill pillows misalign the spine, and stress the muscles. Even many premolded creative pillow designs may work for some people, they just can't fit everyone perfectly. Natural Buckwheat Hull pillows are the best solution. With a buckwheat hull pillow, the natural hull filling molds to fit YOU exactly with full "passive compliant" support throughout the entire head and neck area. The pillow does not compress, it forms around you just like sitting in a bean-bag chair. The pillow provides proper alignment with gentle traction so your spinal discs do not experience shear load. The discs receive proper fluid absorption and vitamin/mineral nutrition recharge during sleep. This results in less pressure on the cervical and lumbar nerve roots where they exit the spine near sensitive discs. 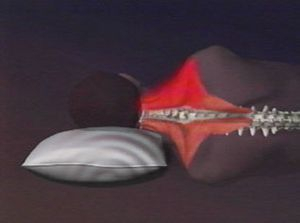 This is why the pillow is also helpful for lower back pain, not just neck issues. Buckwheat hulls mold around your specific body shape and position, then they lock into place providing you with the perfect amount of support regardless of how you like to sleep. Many people toss and turn much less during the night when sleeping on a pillow that gives them the perfect support for rejuvenation and comfort and awake fully refreshed. Often requiring less hours of sleep. Another wonderful benefit with the Makura pillow is the thermodynamic properties of the buckwheat hulls. Your pillow will remain cool in the hot summer months and warm in the chilly winter. You will not sweat on these pillows. The natural fiber absorbs your normal moisture evaporation while you sleep and releases it back each day. Makura Miracle Pillow XL 20 in. x 26" - (equivalent to Standard Size pillow) $54.95; Save $5.00 each when you order two or more. Makura Miracle Pillow 14 in. x 21 in. Traditional size, includes 1 case (equivalent to travel size) $44.95; Save $5.00 each when you order two or more. Rejuvenator Deluxe pillow 20 in. x 26 in. incl snap adjustments $64.95; Save $5.00 each when you order two or more.